My expectations were high for Stay Tuned, the new original musical by Yellow Tree Theatre, for several reasons. In these days of movie adaptations and jukebox musicals, the new original musical is an endangered species, so just those words give me hope. I am a big fan of Yellow Tree Theatre and truly believe in and admire their mission (bring good quality theater to the suburban community that is Osseo, mixing new original work with established classics). 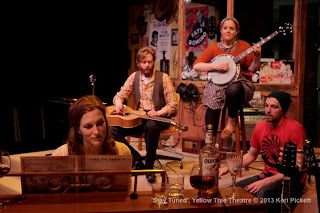 Blake Thomas, who wrote the music and lyrics, is one of my favorite musicians* (thanks to Yellow Tree) and an incredibly talented songwriter, and book writers Mary Fox and Andy Frye are a couple of my Yellow Tree favorites. As opening night approached, I began to fear that my expectations were too high and I would be disappointed with reality, as often happens. I am happy to report that did not happen this time. Stay Tuned is a charming story about American music and its changing forms (from radio and record albums to podcasts and downloads) with really lovely and diverse original music performed by talented singer/actor/musicians. 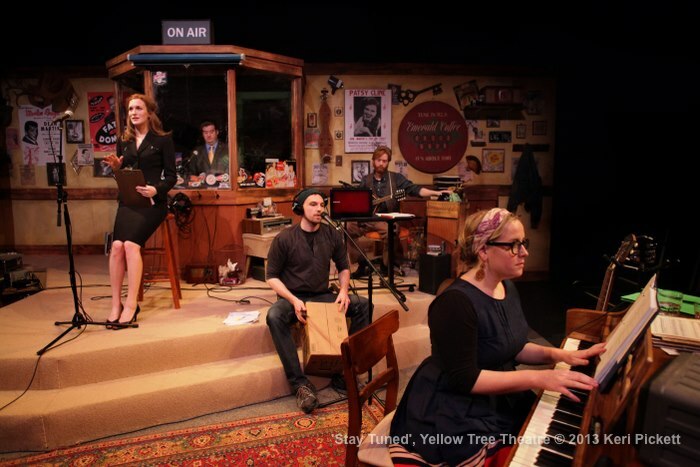 The story of Stay Tuned is that of a fictional radio music variety show called The Emerald Coffee Radio Hour, reminiscent of that real-life beloved Minnesota institution A Prairie Home Companion. When the show's host Bob dies and leaves the show to his son Gordon (the always hilarious Blake Nelson), things begin to change. Gordon hires pop music producer Ashabell (Yellow Tree co-founder Jessica Lind Peterson) who attempts to modernize the show, to the dismay of the show's remaining writers and musicians. Emma and Scotty (book writers Mary Fox and Andy Frye) do their best to work with Ashabell, cutting skits and adding stupid human tricks. But Rusty (Blake Thomas, in a role well-suited to this musician-turned-actor) is having a hard time letting go of Bob and spends his evenings listening to recordings of old shows from the '50s and '60s. The recordings come to life as an old-fashioned mic descends from above and various members of the ensemble appear in period clothing to sing the songs of the past. Gordon is only concerned with making the show a success at whatever cost, with no regard for his father's legacy, but Ashabell soon reveals that under her slick pop exterior is someone who loves music and tradition as much as Rusty and the gang. Eventually, they're able to work together to bring that music tradition to a new audience. I'm not sure that I would classify Stay Tuned as a musical; it feels more like a play with music, in that characters don't break out into song in the middle of a conversation. Songs are not used to express a character's emotions and further the plot, as in traditional musicals. All of the music happens within the context of the radio show, either live performance during rehearsal or broadcast, or while listening to old shows, when the cast sings along to recorded music. The latter moments are fun and showcase a variety of musical styles (from Patsy Cline and Buddy Holly to Frank Sinatra), but the music truly shines when the Emerald musicians sing and play live (guitar, piano, dulcimer, mandolin, and makeshift percussion). I've been listening to the soundtrack (available for purchase at the Yellow Tree box office) all day; favorites include the wistful "Back Home," the hopeful "Love Will Lift You Up," and the sweetly silly "And On and On It Goes:"
And when you see a rainbow do you ever think that it's frowning? And if you do does it make you stop and smile? But the strangest thing is the love that you bring to this strange old fool. All of the music has that familiar Blake Thomas sound,* and the cast sounds great singing these songs (even though I would have liked Blake to sing more than he did). The score is filled with clever and interesting lyrics (see above), catchy or haunting melodies, in a wide range of styles of American music (including a truly awful pop song). 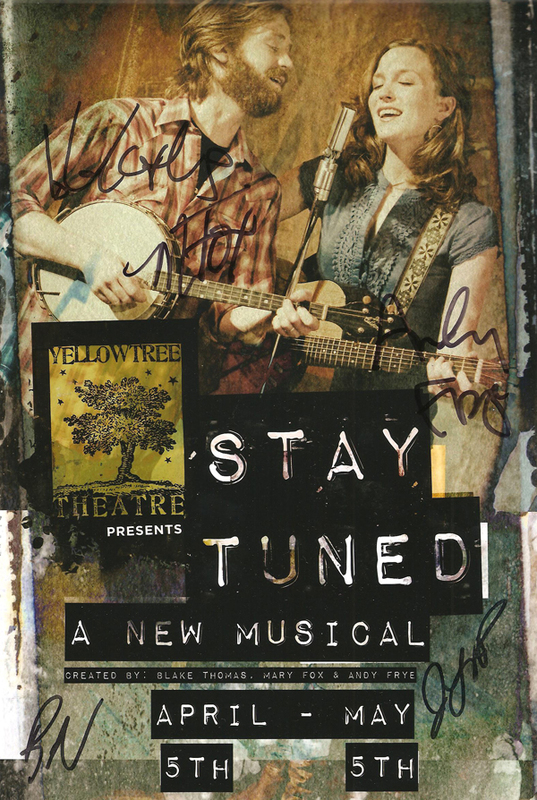 Stay Tuned doesn't look or sound like your typical musical (which isn't a bad thing), but it's a creative and inventive use of music in theater (in that way it reminds me a little of that other not-your-typical-musical that won a Tony last year). The fantastic set (designed by Katie Phillips) is jam-packed with musical instruments and memorabilia, from an autographed poster of Pasty Cline to a Beatles bumper sticker. A piano and record player sit near the front of the stage, with a glassed-in radio control booth at the back. Functional and cozy, it looks like a pleasant place to spend a few hours listening to music. *If you're a fan of country/folk/Americana music like I am, I highly recommend that you check out the music of Blake Thomas (available on iTunes and elsewhere). He has a really great country voice and writes songs with clever and original lyrics and haunting melodies. Flatlands is, start to finish, a nearly perfect album, and the newer The Window and the Light is also fantastic (and features a duet with his wife and co-star Mary Fox). I agree, fantastic play with incredible music! Yellow Tree is that perfect theatre you've been looking for. The talent and fun keeps you coming back for more. Great evening out for all, I enjoyed the opening night...fabulous music, a soundtrack on my list of must haves! Thank you Yellow Tree and Cherry & Spoon!